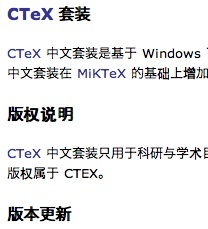 The CTeX project homepage, a portable extension of TeX designed specifically for the professional oriental language typesetting community (content in Chinese). While I see the interest of your proposal for *this* server, I wonder if potential users of Wikka releases might find useful an action requiring a dedicated MySQL table just for storing links to Wikka-powered sites. Or am I misunderstanding you and you are just proposing an action and a table for *this* server? Maybe it would be more interesting if we had some way of paging and (re)organizing alphabetically the content of a page from its source. Think of the potential of manipulating raw code. Imagine for example a page containing a list of entries formatted in such a way that the system (maybe through a dedicated handler) can give the user the choice to display only part of the list, or a paged version, or filter the entries according to some criteria, or even display a form (an interface with the source code) for adding entries, etc. **without** retrieving content from an extra table, but just rearranging the existing content of a page. I find this idea of an interface to list-formatted or tabular content much more challenging and potentially adaptable to the user's needs than an action that just prints Wikka sites. Your opinion? I was indeed thinking of a "Wikka-server-only" table + form. A whiel ago I went through the list which had become disorganized (badly alphabetized) and found it very tedious to determine which entry should go where. Some sort of new "tabular" format that could be easily specified with ts own formatter might help though. I've noticed there are wikis that actually have two "table" formats - one more formal with all sorts of options for colspans and rowspans and headers, and a more simple CVS-like format: just rows with equal numbers of comma-separated data (with some sort of enclosing "tag" of course). For the latter, extra options "sort" and "page" might do the trick. Um, DarTar, I don't really agree that this page is part of the *Documentation*; an "information" category would probably fit better. I do like the new header and intro, though! I know it's not the optimal solution, but we already have too many informative categories: (CategoryDocumentation, CategoryWikka, CategoryWiki) and I'd like to integrate this page with links to and from the documentation pages. For this reasons, I thought that a list of Wikka powered sites might still be part of the Wikka Documentation in a broad sense. I think CategoryWikka would fit better (see the description) - surely you can link from CategoryDocumentation pages to related pages in another category? In fact, such links could be linked from a separate section on the main WikkaDocumentation page, to make it clear it's "related information" but not "documentation proper". How's that sound? What do you mean by Custom Layout please? Sites with custom layout = sites not using the default wikka CSS stylesheet. I had a discussion yesterday with JavaWoman who suggested not to qualify as customized sites that merely changed the font family or made minor hacks to the CSS. Hi GmBowen. Thanks for the compliment. But I looked hard before removing your link - I do not do such things lightly. What I see at http://www.silver-wing.de/ is a site done in vBulletin, which I know can be used as a kind of CMS. At the same time (and I poked around quite a lot), I do not see any kind of Wiki functionality. I looked at page source for several pages, too, and while I saw traces of vBulletin all over the place, not a trace of Wikka. I thought maybe you'd integrated Wikka into vBuleltin - but could not find it. I'm looking again now, and the only thing I can find is the Impressum page that looks like it has some Wikka content (but not the page structure). In other words, what I see is vBulletin used as CMS, not Wikka (not even skinned Wikka) used as CMS. Structure, menu system, user registration, it's all vBulletin (adapted maybe), not Wikka. Now, integrating Wikka into other packages is very nice - but Wikka integrated into what is essentially is a vBulletin site does not make this a "Wikka" site. Not when it's so hard to even find a trace of it. Maybe we need a separate page for Wikka integration projects. Feel free to start such a page, and add your site to it. In that case some explanation of the role of Wikka in the whole framework would not be amiss. I also looked at the page source of ArpY's site and found it impossible to see any signs of Wikka. JavaWoman's comments are right on target. Why promote a site as a Wikka site if it is impossible to recognize any of Wikka in it. Try for example the Impressum Page and add /edit or any other wikka handle to the url - you will see, it is a wikka. It is very little integrated into vB - I'm using the vB authentication and I include the output (with ob_start()) in the template of vbulletin - this is why you can't see very much of it in the source, but it is there ;) You can also try to call default pages which are with a leading "honda-silverwing-" like "honda-silverwing-FormattingRules". Btw you will see no Edit/History links because they are only visible to me when I'm logged in - same for the doubleclick edit. My idea is to use wikka and do a full integration in vB - of course with some modification, this is why I'm waiting for the next wikka release to go on. Then I want to use wikka not only as CMS but as wiki for my community. btw, if you don't find many wikka pages on my site: I just relaunched this site and I had no time to rewrite all the content in wikka pages, but this will be done in the next couple of weeks. Maybe I come back to your offer to start a vB integration page. @JsnX and you: Ok, its true that it is hard to see (that why I added the "Yes its a wikka), but does a wikka only qualify as a wikka if you can see it? btw, one some of the wikka pages at my site I added the html of my old site to be able to relaunch timely - I definetly will work on this! There is a link to Bronzeworks.org that is a nice site but I couldn't understand where their Wikka Wiki is located. It has disappeared, I've marked/masked bronzeworks as 404. I really love CSS - and I hate it's implementations. I tried the above and yes, it looked better in IE 6, but the desired effect of the "cut out navigation" was lost in firefox. I am delivering an extra css to IE now using conditional comments, in IE 6 it looks 'ok' now. In Opera 7.54 the left border of the navigation box starts a few px to high, Netscape 7.2 has the same problem - which is kinda confusing since Firefox and Netscape are build upon the Gecko render engine. Anyhow, this little bit is not to much of a problem for me, especially since removing it 'kills' the desired effect in firefox completly. I will fiddle with the CSS some more tomorrow or maybe later today, when my lectures are boring and the WLAN is working. There must be a solution, actually I have one already, I just need to apply it completly, which might take a while since I don't have just a .html to change, but need to fiddle with formatters and stuff. the original idea is about a year old, I have a version working at ranta.info/old/dafke/ - which even in IE looks almost the same as in real browsers. Ok, I got it working more or less now in IE too (tested with 5.01, 5.5 and IE6). It doesn't look as in real browsers, but it's acceptable for me. There are still some slight differences on the borders between Firefox and Netscape 7, but I don't mind those either since it's a few pixels. One thing that really puzzles me tho: On the page where I took the design from (see above comment) the hover effect is working in IE6 too, on the new page it isnt. If anyone wants to earn some incoming links (from my PR5 blog for example) and my eternal gratitude, enlighten me what I am missing there and how I can get the hover effect to work in IE too. How does one get a site removed from this list? I'm not really happy about having a site listed that's intended for a specific audience only (people I tell about the stie). I do not want to have to password protect these. Sorry, there is a bug. We're ""TeaM-TL"" not ""Team-TL"". Please correct it. In order to allow filtering, counting, broken-links checking and - optionally - displaying different kinds of statistics (by language, by type of website, by charset etc.) this list should be turned into a DB table. A form might be added to allow users to post detailed information about their Wikka-powered websites. I didn't test all the list, I was looking for my own website and it was not in it (maybe because of a customized rootpage, header and footer actions). EmeraldIsland, thanks - I'll remove them from the list. Wikka got me up and running really fast for these! I love it.